3M Radial Bristle Discs can be used for cleaning, fire- scale removal, finishing, blending, texturing, pre-polishing and polishing. These Discs will glide through small grooves or fine detail while they safely apply the finish you desire on a wide variety of precious and soft metals including gold, silver, platinum, copper, brass. 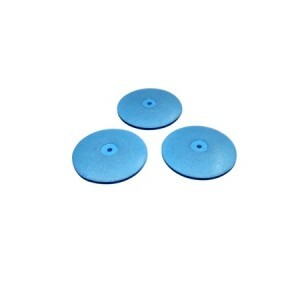 White coarse flat edge silicon polisher. This range is intended for final polishing. Open pore polis..
White coarse Knife edge shaped silicon polisher. This range is intended for final polishing. Open po..
White coarse bullet shaped silicon polisher. This range is intended for final polishing. Open pore p..